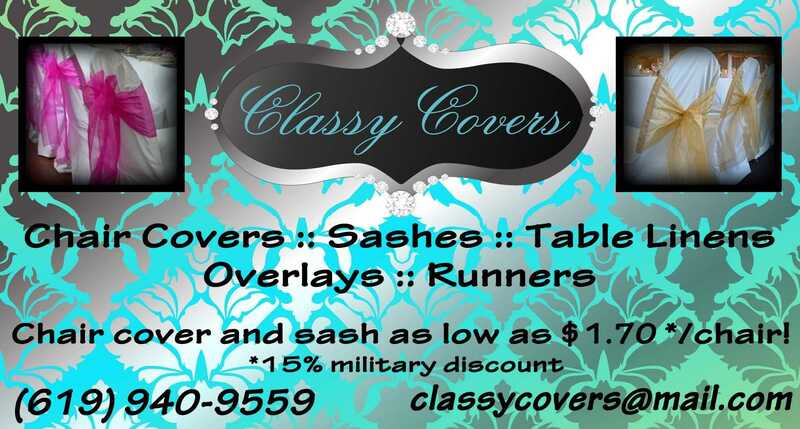 Classy Covers is a company which provides chair covers, sashes, and table linens for all of your event needs. 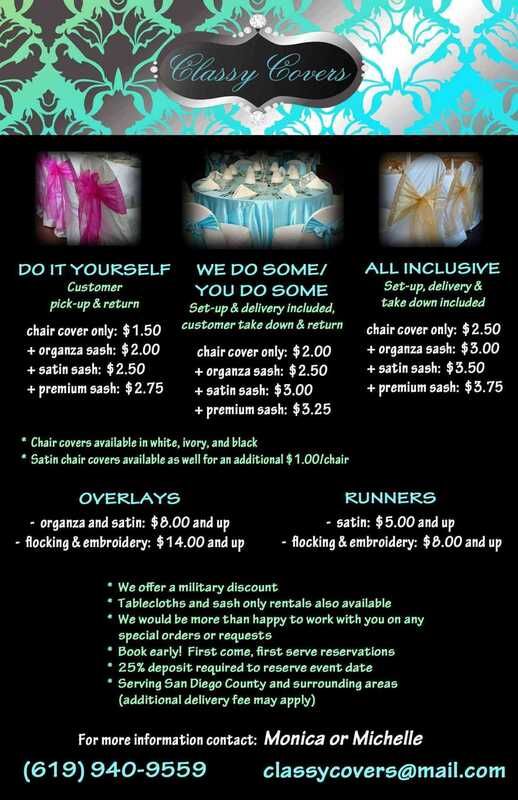 We provide our services for Weddings, Birthday Parties, Quinceneras, Anniversaries, Proms, Graduations, Baby Showers, etc. We have some of the lowest prices in the San Diego area along with superior customer service and high quality rental items. Please contact us for more information and to see if your event date is available, we will be more than happy to assist you with any special orders or rush requests. We include a cozy bridal bungalow, a man-cave, a preparation kitchen, a lakeside gazebo, an outdoor band shell with a large dance area, three different ceremony locations to choose from, and natural outdoor landscaping with tall shade trees for guest seating. With plenty of evening lighting from our Tiki torches and twinkle light wrapped trees, you can enjoy dining and dancing under the moonlight whose reflection shimmers on our private lake. Our wedding package includes the use of our facility and all of its amenities, but allows you the freedom and flexibility of selecting your own caterer that fits your budget and style or select our inclusive wedding package for ease of planning.